Renewable solar energy relies on daylight rather than radiation which generate power through the photovaltaic cells, these cells have two layers of semi -conductors,one positively charged and one negatively charged, when light shines on the semi-conductor the electric field across the junction between the two layers cause electricity to flow , generating direct current (DC). the greater the intensity of the light the greater the flow electricity, a photovoltaic system therefore does not need bright sun light in order to operate and can generate electricity on cloudy days due to the reflection of sunlight. This diagrams gives you an idea of how your PV system will feed your home. 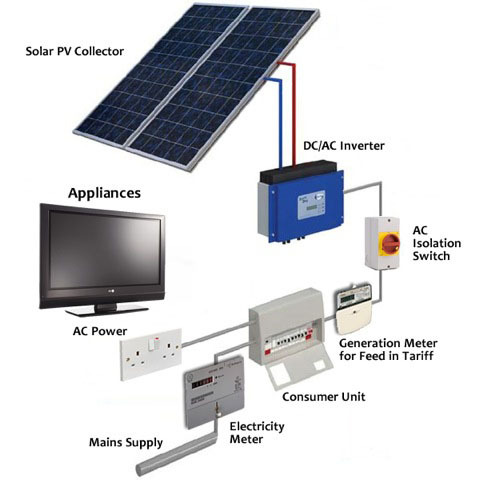 The solar panels produce a type of electricity known as DC (direct current). We cannot use this type of electricity directly into our homes, we need AC (alternating current) instead. To convert this electricity, it runs through a device called an inverter, which constantly monitors the power produced by your solar panels. A single AC cable then runs directly into your consumer unit and onto a single MCB (Miniature Circuit Breaker) via an isolator switch and a generation meter which records the amount of kW/h you produce. Hybrid modules contain a layer of both amorphous and crystalline cells providing best all round performance. Although more expensive, they provide much better output per m2. This is particularly useful when the roof is limited. Compared to other technologies, Hybrid PV Panels will generate more kilowatt hours (electrical units) per year so you will benefit from additional FIT or ROC payments, reducing the payback period of your system and putting you in profit sooner. Monocrystalline photovoltaic cells are cut from a single crystal of silicon and are generally considered to be the workhorses of the PV market due to their high efficiency and dependability. They can be distinguished by their uniform appearance and are usually dark blue or black in colour. Polycrystalline cells are cut from multifaceted crystalline silicon and are distinguishable by their crystal-like appearance. 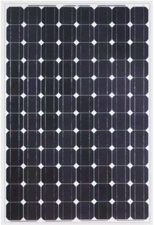 Polycrystalline panels provide slightly lower annual output than monocrystalline panels, but they are in turn slightly less expensive. The amount of space you have available for pv panels can also influence which type of technology you choose. More efficent panels generate more power per square metre than less efficient panels – ideal when your roof is small or partially shaded. The efficency of each technology can be measured by the maximum output per square metre area of photovoltaic cells.